I have "Macbook (13-inch, Mid 2010)" it has white plastic case with 4GB 1067MHz DDR3 RAM and NVIDIA Geforce 320M 256MB. It had originally El Capitan installed. It booted nicely every time. I think that I didn't go trough all software updates it provided. I did a fresh install of High Sierra from USB flash drive. I went trough some installation steps with errors and restarts. Now when I boot, there is a 50% chance of booting to OS. Other times I see grey Apple logo and a progress bar that is filling slowly, gets to 100% and then nothing happens for a whole day. There were some updates of software in between, but they are not related to this booting problem. Is there any way how to fix this problem? three passes of extended Apple Hardware Test; passed OK.
First Aid on HDD; passed OK.
smartctl short and long HDD tests passed with no errors. I tried to reset NVRAM and SMC. Didn't help. I recently did an update in High Sierra and update of the SMC to the latest version provided for my hardware. Didn't help. I was doing some High Sierra updates, re-installs to Lion, El Capitan and Snow leopard and my Boot ROM Version has changed from MB71.003F.B00.18022149 to 66.0.0.0 according to this article from 31.10.2018, my firmware was latest to that day, so i probably have a recent firmware. output of diskutil info disk0 | grep SMART is SMART Status: Verified but as I said I used smartctl to run short and long SMART tests which passed. Anyway SMART looking ok may mean nothing. removed second partition formatted 320GB partition to APFS and reinstalled high sierra from usb flash drive, original distribution from apple store. didn't help it freezes every other boot. What you don't say is how the system behaved before you installed/reinstalled High Sierra. That would be vital information along with what was on it before. That said there could be a lot of things going on. What you are going to need to do if you want further help is to fill in the blanks by editing your original post (don't add a comment edit the original) so we can better be able to assist you. I've created usb flash installer with OSX El Capitan and second High sierra usb flash installer. Installed El Capitan to a partition formatted with older HFS+ journaled file system. Ran updates of El Capitan to the latest version. Plugged in High Sierra installer flash drive. Started operating system update from inside of El Capitan. After that I've tried to boot the high sierra few times and it booted normally each time. The difference is that it runs on older HFS+ file system. Not the answer you're looking for? 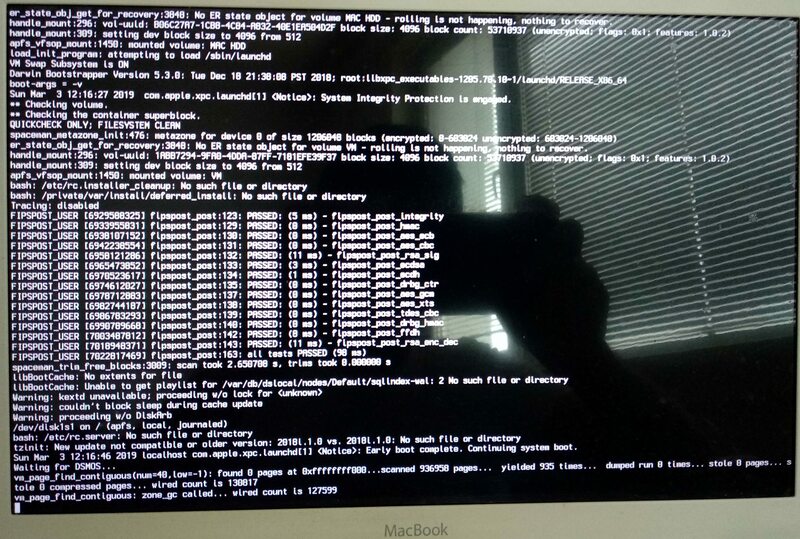 Browse other questions tagged macbook high-sierra boot . What is this progress bar, after initial boot, before login, on High Sierra?